Are you looking for a vacation place that you would like to return to year after year? 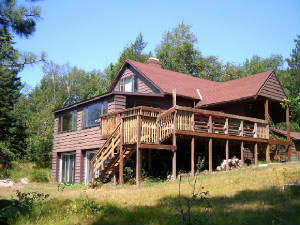 Enjoy views of the lake and woods through the picture windows of this completely furnished home, located in Michigan's Upper Peninsula, 25 miles south of Marquette, near Gwinn, Michigan. The interior is knotty pine, with fireplace in the living room. Play and sunbathe on the deck and swim in the lake. Great fishing in the lake. The first floor has two bedrooms with a queen sized bed in one and twin sized bunk bed in the second. The bathroom is newly remodeled with a shower. The kitchen is fully equipped with gas stove, refrigerator, dishwasher, microwave, all dishes/utensils, pots/pans, coffee pot and toaster. Linens and towels are included. Conveniently located for everything Marquette County has to offer. No Smoking Please. Contact us for rates for the 2013 season. The windows and deck face the lake.